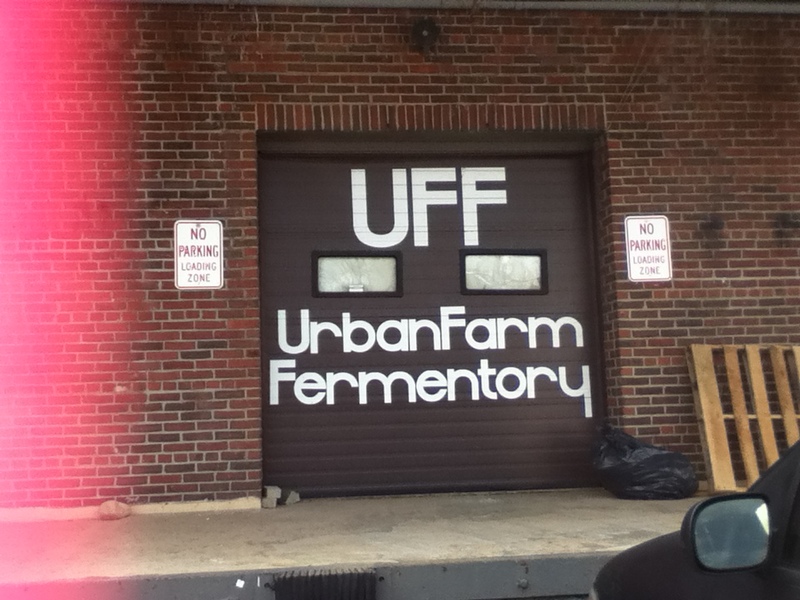 UrbanFarm Fermentory – Breweries, Wineries and the fun in between! We recently went to the UrbanFarm Fermentory in Portland, ME (in early 2013). They are technically a winery, although they produce cider and kombucha. When we entered the fermentory, we had a warm welcome. I am currently on a crutch due to a knee injury and they wanted to know all about it. It felt like we were entering a friend’s house with the welcome presented. We told them that we had found them online and were excited to try out some cider. They create their cider using fresh Maine apples that are spontaneously/wildly fermented (makes even the yeast local) until it is bone dry and tart. My 1st thought- ehhhh bone dry? I don’t like dry… Oh no. Then I remembered what I really didn’t like- tannins. They make you think “dry” and often, unexperienced wine pourers will describe a wine as “dry” when they are talking about the amount of tannins inside. First up for their cider- dry cider. Similar to other ciders in flavor, but not as sweet. Dry and not sweetened with additional sugars, only what nature packed in the apples. Bought a bottle to bring home. Little Jimmy was next- they take their dry cider and age it in old Jim Beam barrels (passed from Jim Beam to a brewery to them). Great flavor. Added that nice bourbon taste at the beginning of the glass and remained consistent throughout. I am not a bourbon drinker, and I still enjoyed this. Mark is a bourbon drinker and liked this better than the dry cider. Bought 2 bottles- 1 for me and 1 for Mark. Their website spoke of mead (wine made with raw Maine honey), but they did not have any available. We tried Kombucha for the first time. Kombucha is fermented tea. It is created with both bacteria and yeast. As noted by the guys at the fermentory, it is not a beverage to be consumed for the purpose of getting drunk. It is used as a health benefit by many, and dates back thousands of years. It does not have a high alcohol content, but has to be sold as an alcoholic beverage due to the content (1.5%) (we were told it has the same content as 7-Up). We tried their Ginger Kombucha. Tart, and with an acidic bite. Definitely had a good tea flavor, with a strong ginger flavor. Mark says it reminded him of ginger ale, without the fizzyness. After trying their Ginger Kombucha, we tried their ChagaChai Kombucha. This Kombucha is made with the chaga mushroom, which is a parasite on birch trees, appearing typically after the tree is dead. It is considered a medicinal mushroom in Eastern European and Russian folk medicine. The ChagaChai did not taste like “mushroom,” instead had more of a Chai flavor. Prefered over the Ginger Kombucha, mostly because I am not a huge ginger fan. I can think of a few friends who would enjoy their Kombucha. Pingback: Our first meadery- Moonlight Meadery | Breweries, Wineries and the fun in between! Pingback: Want to visit Urban Farm Fermentory? There’s a Groupon for that! | Breweries, Wineries and the fun in between! Pingback: New England Distilling, Portland, ME | Breweries, Wineries and the fun in between! Pingback: Visit #90! Allagash Brewing Company, Portland, ME | Breweries, Wineries and the fun in between! Pingback: Sebago Brewing Company, Portland Brewpub, ME | Breweries, Wineries and the fun in between!